We know the official story: On September 11, 2001, 19 Muslims with boxcutters and under orders from Osama bin Laden carried out a surprise attack on the US, a “New Pearl Harbor.” We also know that 9/11 is continually brought forth by the Bush administration to justify the pre-emptive and increasingly costly “War on Terror.” Yet after 53 months, getting the truth about what happened on that tragic day seems impossible. Our government has evaded many many questions about 9/11 and our mainstream media has been unwilling to investigate. David Ray Griffin, a theologian and philosopher of religion, is one of a growing list of prominent scholars and others in the U.S. to step forward and openly challenge the official account of 9/11. Operating from the principle that all suspects who had the means, motive, and opportunity should be investigated, Dr. Griffin brings to the light of day many omissions and distortions of fact in the official document of the official story—the 9/11 Commission Report. Charged with providing the "fullest possible account" of 9/11, The Commission ignored a profusion of facts that contradict the official story and, according to Griffin, point to some level of complicity by insiders in our government. 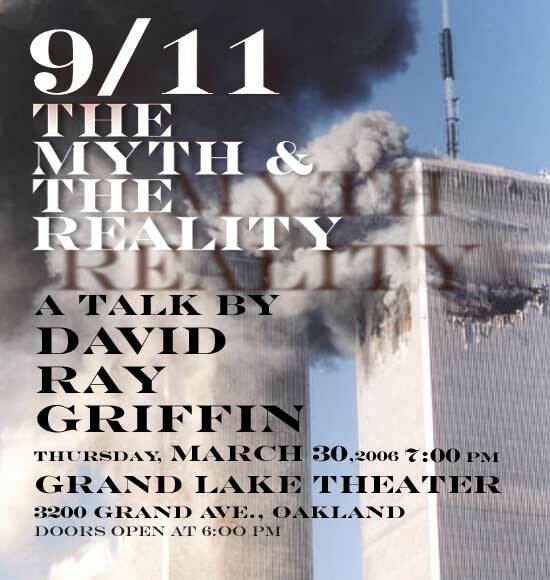 We have invited David Ray Griffin to Oakland so that he might enlighten us regarding these remarkable but relatively unknown facts regarding 9/11. We hope you'll join us at the Grand Lake to hear him. If Griffin's argument is compelling, it is up to us all to insist on a new investigation that is truly independent, effective, and that investigates all of the facts, so that the perpetrators of this crime are brought to justice. Unanswered questions regarding 9/11 is the most important issue facing America today. Implications for democracy, the US Constitution, and freedom of information are all tied into who facilitated and benefited from 9/11. David Ray Griffin is our leading scholar on 9/11 issues. He avoids wild who-done-it theories and focuses instead on key questions that give serious doubt to the US governments official 9/11 story. Griffin's questions are a compelling rationale for further investigation.